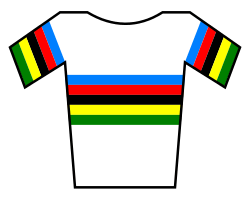 Marcel Kint (20 September 1914, in Zwevegem – 23 March 2002, in Kortrijk) was a Belgian professional road bicycle racer who won 31 races between 1935 and 1951. His finest year was 1938 when he won the World Cycling Championship, three stages of the Tour de France and the season-long competition equivalent to today's UCI ProTour. He specialized in one-day classic cycle races and won Paris–Roubaix, Gent–Wevelgem, Paris–Brussels. He was the only three-time consecutive winner of La Flèche Wallonne until 2016 when Alejandro Valverde won his third consecutive race and fourth overall.